This extra comfortable cap is similar to our popular OD (olive drab) cap ... but the bold graphic design takes it to another level. 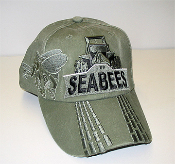 In addition to with word SEABEES there are FIGHTING BEES on the sides and a dramatic bulldozer on the front in a duo-tone embrodiery. The extreme design has the tracks of the 'dozer running down the bill of the cap. Everyone that sees this cap wants one. Order yours today!